The complex network of pathways covers the ancient communication roads on the islands and for many years has been a sort of temple for mountain bikers, to the point that professional mountain bikers have competed for the World Cup here. One does not need to be a great professional mountain biker to ride in the Tuscan Archipelago National Park, surrounded by nature. Many of the pathways suited to bikes are also meant for inexperienced bikers. If you want to improve your mountain biking during your holiday, there are numerous qualified centres on the island providing courses and guided excursions. AROUND THE ISLAND BY BICYCLE. 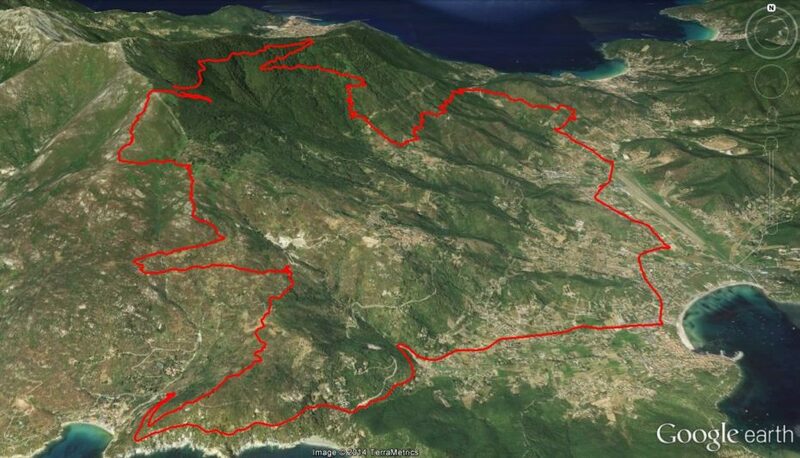 If you still prefer the dear old “racing” road bike, you can emulate your heroes by taking part in the Tour of Elba. After departing from Sant’Andrea, the route goes going towards Patresi, Chiessi and Fetovaia, reaching Marina di Campo, then continuing towards the east, passing all the most famous places on the coast (Porto Azzurro, Rio nell’Elba, Volterraio, Portoferraio). The climb up to Marciana is the last one before the descent leading back down to Sant’Andrea. FOR MORE EXPERIENCED BIKERS. 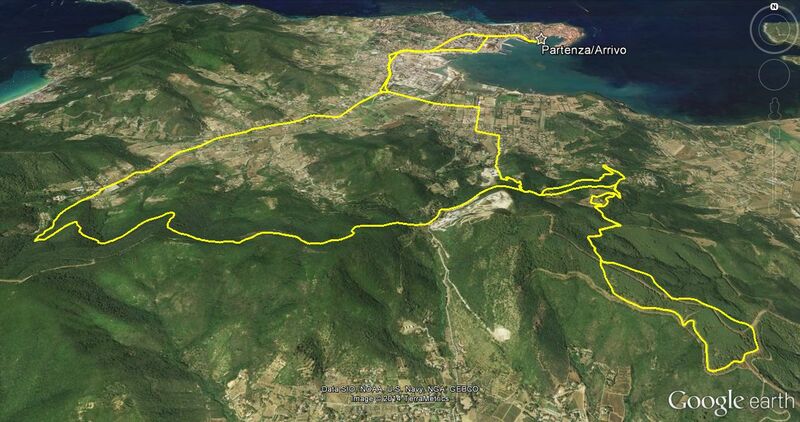 There are some itineraries on Elba which no serious mountain biker should miss. The tough climb to the Sanctuary of the Madonna of the Mountain and the descent towards Chiessi are only the first examples which come to mind, but the list is so long that one holiday would not be enough to cover them all. A proper open air gymnasium to test the technical level achieved, have fun in a group and discover this marvellous island on two wheels. Panoramic excursions, free riding and single track along paths flanking the sea, mineral lakes, granite rocks or crossing Mediterranean woodland, through forests with the perfume of strawberry trees, holm oak, feather grass, juniper and mastic, arriving at the most renowned towns by unusual routes and bicycling through them. The island of Elba is rich in pathways winding through the most suggestive places, offering the possibility of getting to know enchanting places by doing sports and enjoying unforgettable views, all on your own bicycle. Departure from the Molo Gallo near the old Medici docks (Portoferraio) and continuing towards Monte Orello. Here, the route forms a ring around the mountain, giving a unique view of the island of Elba and the other islands of the Tuscan Archipelago and Corsica. It then enters a pathway surrounded by greenery, passing through San Martino, where Napoleon’s summer residence was located, continuing on towards Portoferraio and returning to the departure point. The route can then be completed with a tour around the old Medici walls of Forte Falcone and Forte Stella and the historic centre of Portoferraio, descending down the Napoleonic stairway! The initial route is on the provincial road, and then along a pathway surrounded by the forest of San Martino, down the gravel road of Poggio al Molino. The route alternates between climbs and descents along another 5 pathways completely surrounded by nature, where the perfume of strawberry trees, holm oak, feather grass, juniper and mastic is very noticeable. The last pathway leads back to the provincial road from Enfola towards Portoferraio and back to the departure point. Difficulty: Good cycling skills required. Physical preparation: Good in order to complete the entire route, but the itinerary can be cut at any point, giving the less physically fit the chance to take part in this excursion. Departure from La Pila locality, near the car park at the junction for Sant’Ilario. The route begins with a very difficult climb up to Monte Perone, followed by a moment’s respite with a descent, after which the route continues with another uphill stretch along a difficult pathway, reaching Masso alla Quata (740 m). A stop here is a must to enjoy the incredible panorama, restarting with a technically difficult descent down the “Dei Pastori” pathway, reaching Piana al Canale. The route then continues in descent towards Mulino del Moncione and the Granite way, lastly descending quickly down the provincial road in the proximity of the beach at Cavoli. From here, the route continues for about 7 km on an asphalted road back to the departure point. Difficulty: Excellent cycling skills required both downhill and in some stretches on pathways around the Mulino del Moncione. Physical preparation: Good in order to complete the route, but it is possible to cut the route before Masso alla Quata, beneath the Mulino del Moncione, avoiding the last descent to Cavoli and significantly reducing the distance, height difference and physical effort required. Departure from Porto Azzurro near the junction for Barbarossa. The tour is divided into two parts: the first is panoramic towards Monte Castello and the second along a pathway around a mineral lake with a suggestive bright green colour in the area of Terranera. The first part if on compact by gravelly ground going uphill towards Villa Bacci, along the Cala Mola flanking the town of Capoliveri, descending towards Valdana and then climbing again from Buraccio until reaching a panoramic viewpoint over the Gulf of Portoferraio and the Valle di Monserrato. From here, the route descends to Porto Azzurro, through the town and continues towards the last stretch, towards the suggestive Laghetto di Terranera and back to the departure point. Difficulty: Reasonable cycling skills are required for the descent from Buraccio to Porto Azzurro, which is on stony and uneven ground. Physical preparation: Good in order to complete the route, but it is possible to cut the route before going towards Laghetto di Terranera. The participants will meet with us on Friday evening to briefly illustrate the route and excursions. 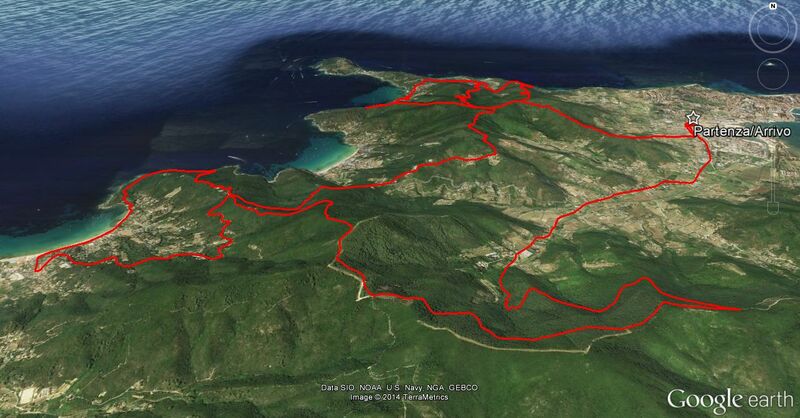 SATURDAY: departure at 08:00 towards the summit of Monte Castello, from where most of western Elba is visible. From here, the route continues to Porto Azzurro, beneath the walls of the Spanish Fortress of San Giacomo and down to the beach at Barbarossa, then along the shores of the suggestive Laghetto di Terranera, returning at about 12:00. The excursions are about 35-50 km long and can be changed according to the preparation of the bikers and/or group performance. These two excursions are advisable for bikers with reasonable technical skills and physical fitness. SATURDAY: departure at 8:00 from Marina di Campo, the first stretch is a difficult climb along the gravel road leading to Monte Perone, with another technically difficult climb up to Masso alla Quata (720 m), where there is a spectacular panoramic view over the southern coastline. Before departure, there will be a brief stop for photos in front of the granite rocks and mountain goats. From here, the descent finally begins along a pathway slaloming between chestnut and other large trunk trees. After another brief climb, there is a descent along a pathway with breath-taking views, which then reaches the sea and then the small village of Seccheto, from where the return route is along the provincial road to Marina di Campo. 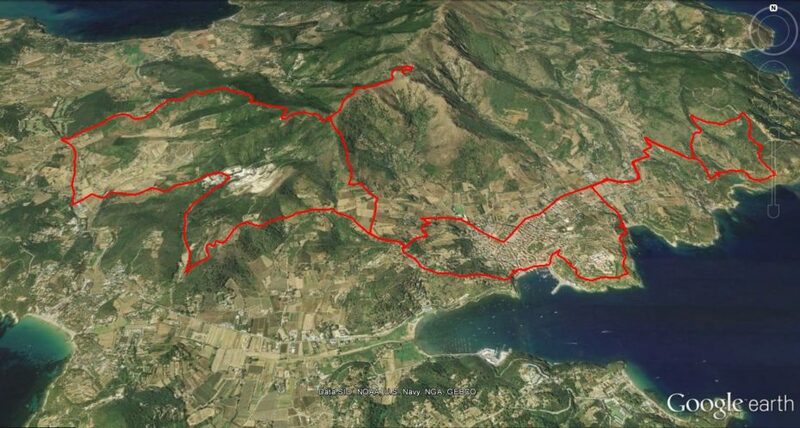 SUNDAY: departure is again at 8:00 from Marina di Campo, up the same difficult climb as the previous day. After reaching the crest of Monte Perone, the route continues along the opposite side from the previous day and after a brief asphalt stretch, there is a technically difficult and panoramic pathway which leads to a point a few hundred metres from the summit of Monte Capanne. From this point, only the most skilled riders will be able to keep up. At the end of the pathway, after assessing the tiredness of the group, a decision will be made whether to return via the hermitage of San Cerbone, Re di Noce and le Solane, arriving back at Marina di Campo, or to return via Serraventosa, il Troppolo (740 m) and the technically very difficult descent to Pomonte, returning to Marina di Campo on the provincial road. These excursions are advisable for bikers with excellent technical skills and good physical fitness levels. The excursions are about 40 km long and the route may be changed according to group performance and the fitness of the participants. 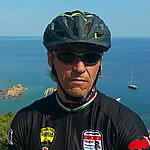 An Italian National Accademy of Mountain biking guide with great experience of the trails of the island, Gian Piero organizes guided tours for enthusiasts like him. We thank him for his contribution to this article.